Ridgeway Path; Goodbye Humanosaurus; Space Wray; Rocket; Goosey Goosey; Blue Beret; Zonked Right Out (On Life); My Train is Coming; Child Crusade; Difficult Age; Was a Yes (extract); No One Here Available; Don't You Ever Dare Call Me Chickenhead; Everything; This is the End. Features liner notes by Partridge describing every song. 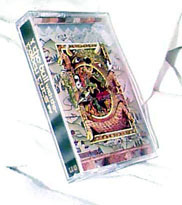 North American fan club limited edition cassette. CT, Little Express Canada, LE 03, March 1992. BUYER PAYS SHIPPING. GOOD LUCK!